Good news, Firefox fans: One of the most useful features in Google Chrome is being developed for Firefox. One of my favorite features in Google Chrome is the noisy tab indicator and the early trial feature that mutes noisy tabs with one click. Now, that same feature is coming to Mozilla Firefox—or at least, we hope it is. Mozilla developers are actively testing and designing a noise indicator that appears on a browser tab when audio is playing. Whether the noisy tab indicator will actually make it to the mainstream version of Firefox is unclear. But I was able to grab an early test build of Firefox to see how the feature is developing. Firefox developers are working on a mute noisy tabs feature. Similar to Chrome’s implementation, Firefox’s early trials display a noise indicator in your browser tab. If you want to mute the audio, you hover over the noise indicator, right-click it and select Mute Tab. Boom! No more noise. The mute feature also works even if the noisy tab isn’t the active page. In the test build that I tried, this feature only works with HTML5-based videos and not Flash. However, developers are working on implementing the ability to detect Flash audio for Windows and Mac users. As the feature stands right now it feels like a bit of a cheat. In my tests, the browser simply pauses the video when you hit the Mute Tab option. 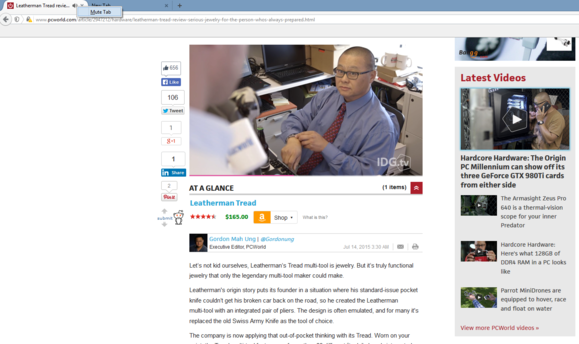 Oddly, the video pause is independent of the actual video player controls on the webpage itself. UPDATE: The pause issue is a bug that will be fixed by the time this feature goes public. The Mute Tab feature in a very early build of Firefox. In other words, if you try to play/pause the video with the usual player controls after you’ve hit the mute tab control, the video won’t start. To get the video going again you’ll have to unmute it first via the tab’s noise indicator. It’s clear this feature isn’t ready for prime time yet—but that’s to be expected as the feature is only in the very early test phases. The important thing is simply that it’s being worked on. The impact on you at home: It’s not clear when it might land in the stable version of Firefox. At this writing it wasn’t even available in the official nightly builds. However, considering how many people love this feature in Chrome, my guess is it’s highly likely the mute tab feature will become a standard feature of Firefox—as long as the development process doesn’t hit any major roadblocks. While the mute tab feature is still in early days on Chrome as well, the actual noise indicator itself is more than a year old. Google was able to beat other browsers to the punch with this feature, because its noise indicator works with both HTML5- and Flash-based media. Google has a customized version of the Flash Player built-in to Chrome, which presumably means it can develop features for Flash that other browser makers can’t. Until recently, the standard version of Flash did not offer a way for browsers to figure out whether a sound was playing from Flash-based media. All Firefox could do was know whether Flash was in use at all. That’s doesn’t help much, because it would be silly and confusing to put a noise indicator at the top of a tab if, say, Flash was only being used to display a silent animated ad. It also isn’t great for the user to only have a noise indicator when HTML5 videos are playing—unless, of course, you knowingly wanted that feature by installing the Noise Control add-on. So Firefox developers were stuck with a Flash problem until earlier this year when Adobe added the ability to detect Flash-based audio. That said, it’s entirely possible Mozilla could release this feature with the HTML5 functionality first and then add Flash compatibility later. Regardless, let’s hope we see this feature hit Firefox very soon. I can think of a few sites this would be useful for, and I’m sure you can, too. UPDATE (7/16/15): Mozilla developer Ehsan Akhgari confirmed to PCWorld that the new mute noisy tabs feature will also work with Flash content on Windows and Mac—the platforms the new Flash API supports. There’s no time frame yet for when you’ll be able to mute tabs in Firefox because the Mozilla developers behind the feature are working on it in their spare time. If you want to know when this feature will land in Mozilla’s nightly builds keep an eye on Akhgari’s blog as he plans to announce when the feature is ready for early trials.